One year later, the 1907 Chicago White Sox, fresh off a World Series win, celebrated with something truly revolutionary—the first commemorative sleeve patch in MLB history. The White Sox are real modest in letting the public know that they are the champions of the world. Instead of "World's Champions" being across their breasts a la the New York Giants, they have their emblem in a monogram on the shirt sleeves. On the sleeves of the shirt appears a map of the world, bounded on the north, south, east, and west with the inscription "World's Champions White Sox." The roots of the patch design lie in an expensive piece of championship bling. In those days before rings were awarded to World Series winners, the champion White Sox were presented with watch charms. Produced by a Cincinnati jeweler, Frank Herschel Company, the charms were valued at $1,600 each—$40,000 each in today's dollars. There was plenty of significance attached to each element within the design. The team's navy blue uniforms are referenced, along with what was described as "mercury wings, the sign of the great speed which carried the Sox on to victory." The design was amended when the Sox won the 1917 World Series and was used until the death of owner Charles Comiskey in 1931. The original concept for the logo—a championship charm—was abandoned, as was the Mercury wing (although the wing was restored in the late 1950s as a nod to the "Go-Go Sox, the 1959 American League champions." 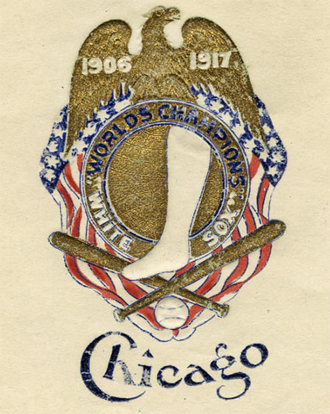 There is evidence that the Chicago Cubs, who lost the 1906 Series to their crosstown rivals, planned to wear a celebratory sleeve patch as well in 1907. The November 24, 1906 edition of Sporting Life noted that a new emblem designed by Cubs owner Charles W. Murphy would "probably be sewed on the right sleeve of the players next year." It never happened. The next team to celebrate a championship with a special uniform was the 1921 Cleveland Indians. 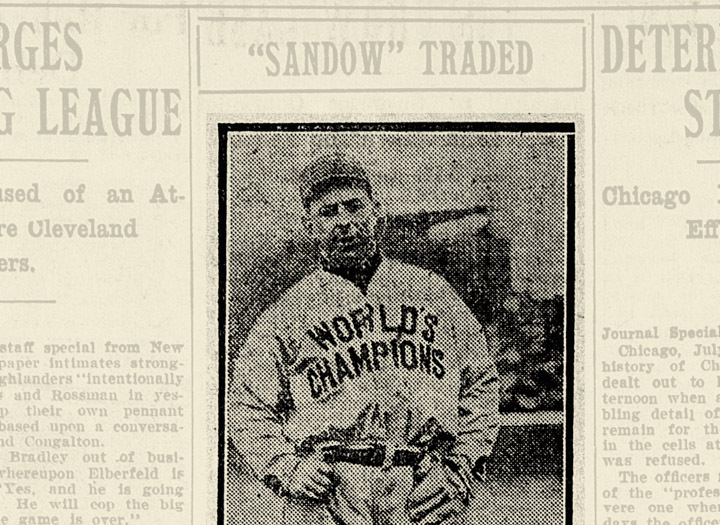 They failed to repeat, as did the next club to boast of their title status, the 1927 St Louis Cardinals. Maybe that's why no other club decided to salute a championship season on their uniforms for another 50+ years. The 1981 Phillies commemorated their Series win of the previous fall with appropriately-designated warmups, but not on their uniforms. Finally, in 1984, the Baltimore Orioles decided to combine two noteworthy events into one celebratory sleeve patch. Their World Series victory of the previous season was featured, along with a nod to the club's 30th anniversary. This would mark the last time that a defending champion would acknowledge their bragging rights on their uniforms for another 20 years. The 2004 Florida Marlins inaugurated a new era by wearing a commemorative "World Series Champions" sleeve patch all season long. The 2005 Boston Red Sox trotted out special uniforms for their home opener at Fenway Park, featuring gold trim and a one-day commemorative sleeve patch. The 2006 White Sox wore a champions patch at home that season. The 2007 Cardinals continued the gold-trimmed tradition for their home opener, along with special patches on their home jerseys all year long, a scenario that the Philadelphia Phillies followed two years later. The 2011 Giants opted for gold trim for the home opener, along with a season-long sleeve patch worn both at home and on the road. The 2012 Cardinals did likewise. The Giants wore special gold-trimmed caps and jerseys for the 2013 Opening Day ring ceremony, and sported a commemorative sleeve patch all season long. Finally, in 2014, the Red Sox broke out the gold trim (and requisite patch) for their ring ceremony—and that was the extent of their sartorial celebration. Which brings us back to the 2015 Giants. Should they go the route of a uniform celebration, their challenge will be to do what every single team that similarly amplified their status has been unable to do—repeat as World Series champions.